Originally published on EV Obsession. 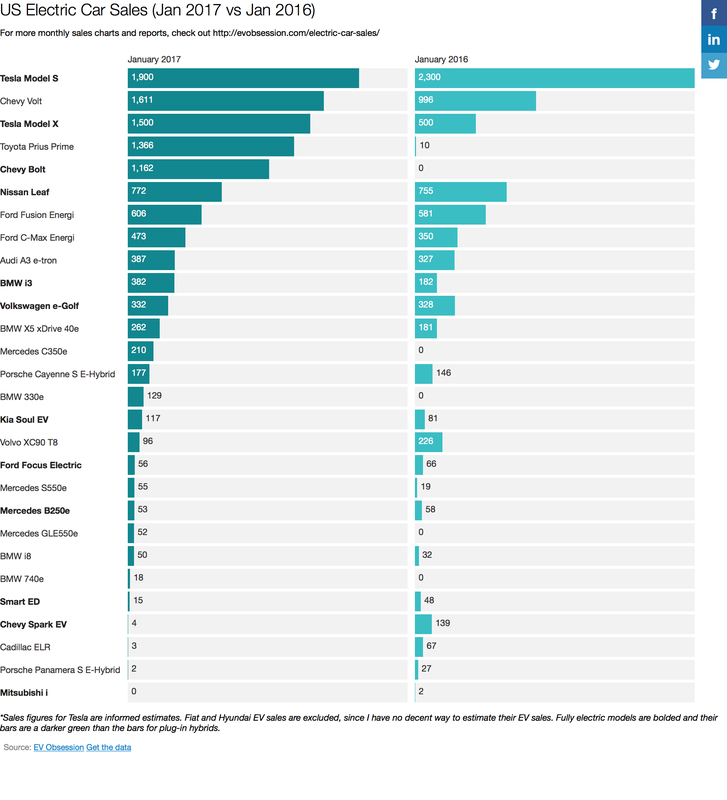 See our Electric Car Sales page for a deeper look at US, European, and Chinese electric car sales. US electric car sales continue to climb to new heights in 2017. Growing 59% year over year (YoY), approximately 12,000 electric cars were sold across the country in January, accounting for approximately 1% of US auto sales. The top five models accounted for approximately 40% of total US electric car sales, as most models are still compliance cars that are not designed or marketed to really pull in buyers — and aren’t even available in most states. Essentially, Tesla and GM are pulling the market forward. The Toyota Prius Prime, though, is a top-of-the-line Prius that is fairly widely available, is building off of the popular Prius name and reputation, and is genuinely cost-competitive with (a better deal than) a conventional Prius — especially once you take the US federal tax credit into account. The Nissan LEAF — introduced all the way back in 2011 — is still hanging in well above the crowd as well, though. Again, its success relative to other models is quite simply due to its wide availability, the fact that it was designed to be a competitive electric car from the ground up, and some decent marketing/promotion. Most of the remaining models on the market are hard to find outside of California and Oregon, which makes any evaluation of the “US” EV market still a bit odd. Can you imagine how the Ford F-150 would do if it were only offered in one or two states? Electric car sales of all types (fully electric cars and plug-in hybrid electric cars) were up 59% YoY. Plug-in hybrid sales were up 86% YoY. Fully electric car sales were up 41% YoY. The Chevy Volt saw a 62% YoY sales increase, and accounted for ~8% of US electric car sales. The Tesla Model S and Model X accounted for 10% and 8% of US electric car sales (respectively), according to our estimates. The Chevy Bolt is hopefully still very production limited, as ~1200 monthly sales is well below expectations. Given limited geographic availability, though, it seems most logical that the model is still heavily production limited for some reason — such as lack of battery supply.